Pawan Kalyan wraps up his Porata Yatra in Uttarandhra today. He held protest rally in the name of ‘Nirasana Kavathu’ in Visakhapatnam. Jana Sena chief walked from Maha Kali temple to YMCA. His fans and followers attended the rally in large numbers. 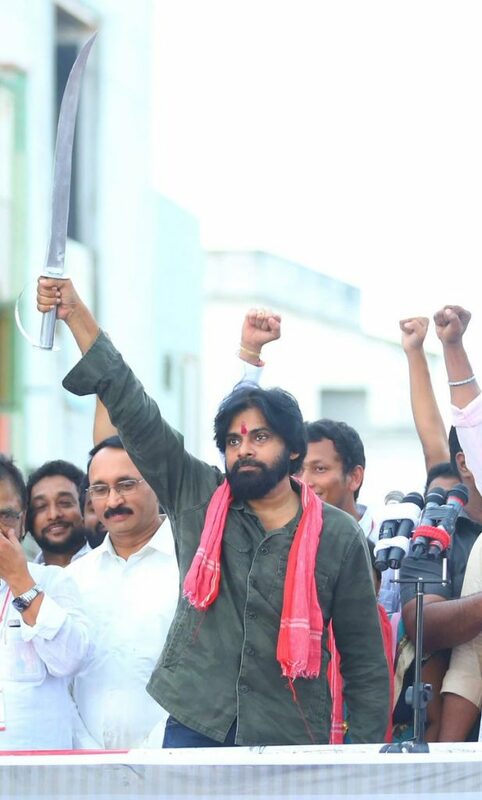 Pawan was accompanied by Jana Sena leaders including scholars like Acharya Chalam. Pawan lambasted at TDP government for rampant corruption in governance. He alleged that CM Chandrababu Naidu doesn’t do anything if its not profitable to him or his aides and hence metro rail didn’t come to Vizag. He accused that government is working for handful rich businessmen like Ghanta Srinivas and Narayana. The power star alleged that TDP government has grabbed lakhs of acres of land in Uttarandhra. In his witty remark, Pawan reminded that red sand cliffs and dolphin nose which were once considered landmarks of Vizag and where Chiranjeevi’s ‘Eureka Sakameeka’ Song was shot are now occupied by bigwigs. Pawan has been voicing for problems faced by Uttarandhra people. He slammed at leaders like Actchan Naidu and Dharmana Prasada Rao who hail from the district for keeping mum for years having elected by people. Pawan demanded center to grant special status and special railway zone to Vizag. He gave a call to block trains passing through Vizag for central government to acknowledge their anguish. He urged Chandrababu Naidu, YS Jagan and Congress leaders to join hands in the protest and that he would walk behind them.